Phillip started running in 1977 to get in shape for soccer season. His friends wanted to run a 10k so he started training to hang out with them. The difference? Phillip kept running; his friends didn’t. 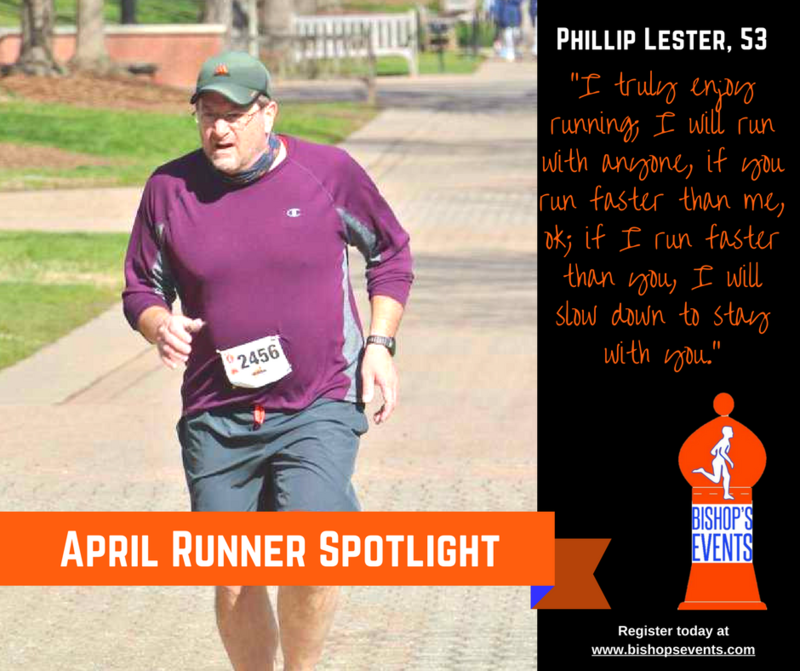 Phillip has completed 18 lifetime races with Bishop’s Events and is aiming to run a total of 30+ races this year alone. One of his biggest accomplishments was completing the Lower Potomac River Marathon. Phillip say he “ truly enjoy[s] running; I will run with anyone, if you run faster than me, ok; if I run faster than you, I will slow down to stay with you. I have driven more than three hours to run a 5k because I thought the course was cool.” On race day you will likely find him using his favorite piece of running gear, his Garmin watch, and grabbing Teddy Grahams as his post race snack. One day, Phillip hopes to complete the Peach Tree Road Race in Atlanta. Until then, we look forward to seeing him at many of our Bishop’s Events races!